Quickly after Mara’s six month check up we realized she would need a new seat soon. She was 25 and 3/4 inches long and once she hit 26 she needed to be in a bigger seat! We opted for the cool cow print one seen here. She seems to like it but I’m sure she will like it much better when she can face forward in it which legally is when she’s 20lbs & 1 year old. 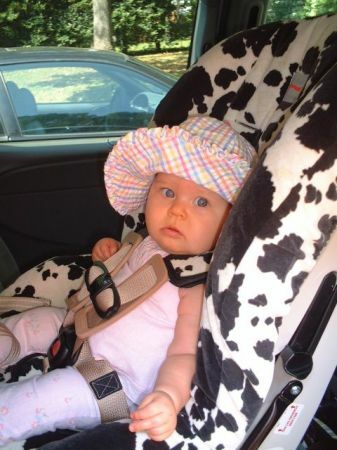 She’ll be stylin’ in her cow print seat in mom’s new inferno red minivan!